There are a few places I've been where I feel most like myself - more alive and understood without saying anything. Taos New Mexico is one of those places. I have been going for long weekends as often as I can since I've moved back to Colorado and it's the place I get asked about most frequently. It's a 5ish hour drive from Denver so it's a great long weekend destination. Not convinced? Look at these pictures and maybe read my absolutely biased opinions on one of my favorite small towns. Taos was incorporated in 1934, and has a population of only 5,731 people. There is a small downtown plaza with neighborhoods of adobe houses surrounding it on mostly dirt and gravel roads. Taos has a distinctly "dirtier" vibe than nearby Santa Fe - part of why I like it. It has over 80 art galleries (seriously), is 81% democratic (seriously), has several ski areas nearby, 3 art museums, is/has been home to Aldous Huxley, Gary Johnson, D.H. Lawrence, Julia Roberts, Donald Rumsfeld and allegedly the "Taos Hum" - a reported widespread low frequency hum in the area that was referenced on Unsolved Mysteries and the X-Files. It is an eclectic place to say the least. Bordering Taos on the North side is the Taos Pueblo that has been around since somewhere between 1000-1450 AD and is one of the oldest continually inhabited communities in the United States. 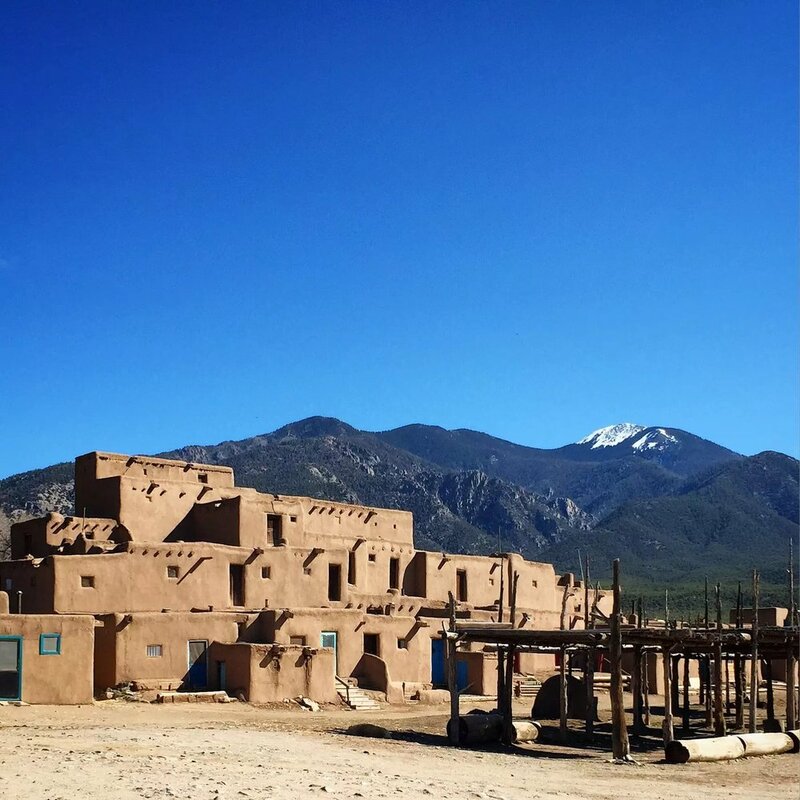 You can visit the Pueblo (and you should) for a small fee and either catch a tour or roam around yourself. While there are 1,900 Taos indians living in the area there are only about 150 that live in the Pueblo year round. I had some fascinating conversations just wandering around with the people who live and work in the Pueblo. One of the best things about Taos is that you can spend a weekend there and never even go into the city. The town is spread out with many interesting abodes. One of the places I come back to often is a geodesic earth dome (below). I've stayed several times and it's the perfect peaceful retreat. I only met the property manager once - briefly - who explained that this area is known as "introvert heaven" and I understand why. I've spent entire weekends here cooking, reading, painting, taking long baths, laying in the grass outside, and not speaking to another person the entire time. Heaven indeed. I've also stayed in a couple of tiny homes/airstreams/vintage trailers - this one is in the same area as the dome and was also the perfect place to spend a weekend alone. I read three books, drank wine, watched the sunsets, and then woke up with the sunrise for three days and it was magical. There is something about the sky in New Mexico - I could sit and stare for hours. Not into naked hippies or hiking? Head to Taos Mesa Brewing which is just a short drive from the springs. The original "mothership" is actually in El Prado - an unincorporated Taos suburb - but there is now also a smaller downtown tap room location. 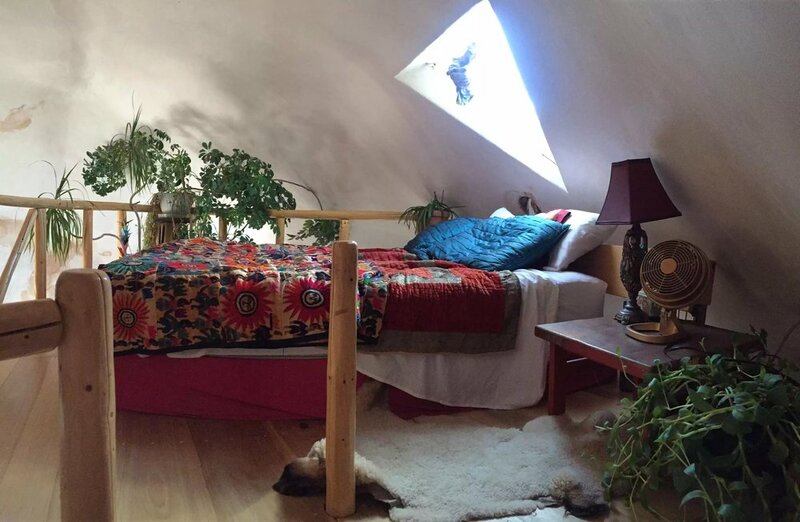 It was built in the same sustainable building style of the Earthships down the road (and down this blog post) with salvaged materials and within 5 years it should be totally off the grid. The beer is good, the food is good, they have live music, an awesome outdoor space, and tons of cool people. Also - the best view of the majestic Sangre de Cristos. Another 6 miles down the road in El Prado is Earthship Biotecture World Headquarters. An Earthship is a type of passive solar home that is made from recycled, salvaged, and up-cycled materials (tires, bottles, cans etc). You can visit the model home and learn about Earthships as well as rent one for the night - next on my list. The community was started in Taos by architect Michael Reynolds but Earthships can now be found all over the world. It's a fascinating topic and the homes are super artistic and livable. Definitely worth a visit.